Today, Gov. Chris Gregoire announced that the proposal submitted to the Washington State Department of Transportation (WSDOT) by Seattle Tunnel Partners is the best apparent value to WSDOT and taxpayers. The tunnel is the preferred alternative for replacing the seismically unsafe Alaskan Way Viaduct along Seattle’s waterfront and designs were submitted by Seattle Tunnel Partnersand Seattle Tunneling Group in October.Both teams' proposals were below the contract price limit of $1.09 billion. Today, the technical scores of those proposals were combined with the bid prices, which were opened as part of a bid-opening event in downtown Seattle. The design-build contract is expected to be awarded later this month. Design-build combines project design and construction in a single contract. Seattle Tunnel Partners is a joint venture of Dragados USA and Tutor Perini Corp. The team also includes Frank Coluccio Construction, Mowat Construction, HNTB Corp. and Intecsa. Their bid price is $1,089,700,002, and technical credits totaled 71,577,000. The combined apparent best-value score is 1,018,123,002. “Both teams submitted proposals that demonstrate this project can be delivered on time and within budget, and went above and beyond in offering creative ideas. It’s time to get to work,” said Gov. Gregoire. The Seattle Tunneling Group submitted a bid price of $1,088,302,002. Technical credits came to 38,152,000. Their combined apparent best-value score was 1,050,150,002. "The price from Seattle Tunnel Partners was slightly higher, but our evaluation of their technical approach found it will deliver the best apparent value to WSDOT and taxpayers," said Washington State Transportation Secretary Paula Hammond. 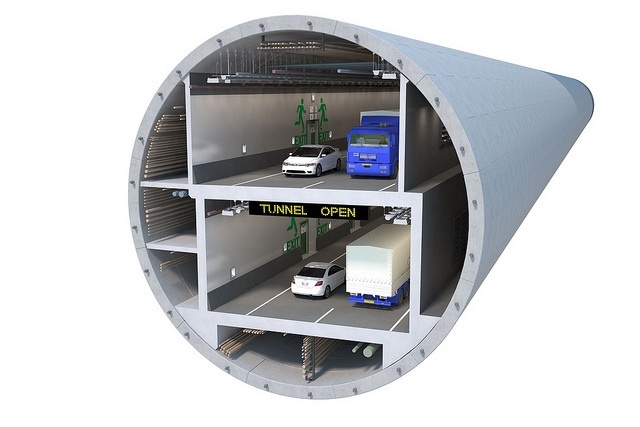 Major items contained in the design-build request for proposals included acquisition of a tunnel boring machine; boring the tunnel; and building the road within the tunnel with ventilation, and emergency and electrical systems. The contract will also cover construction of two operations buildings, mitigation for tunnel settlement and construction of tunnel portals. Most of the work will be performed as a lump-sum, fixed-price bid. There were up to 100 million technical credits, in the form of dollars, which could be earned by each team in the areas of overall management, schedule, tunnel roadway clearances, management of tunneling and ground deformation, and design and construction other than tunneling. Total cost of the proposed bored tunnel is estimated to be $1.96 billion. This includes design, right-of-way acquisition, construction management, and more than $200 million set aside for risk. Also included in the $1.96 billion are separate, future construction contracts for roadway connections at the north and south ends of the tunnel. The proposed bored tunnel is currently under environmental review. A Supplemental Draft Environmental Impact Statement (EIS) that analyzes the bored tunnel alternative is available for public review on the program website. The EIS comment period ends Dec. 13. For more information on the Alaskan Way Viaduct and Seawall Replacement program, visit http://www.alaskanwayviaduct.org/.